Four forces determine how fast you ride: propulsion, gravity, rolling resistance, and aerodynamic drag. Riding conditions present the rider with a continuously changing mix of these forces. How the cyclist rides the bicycle while climbing is a critical component of success, so form while climbing should be the best it can be. Although most athletes and coaches accept stretching as a means to improve performance and prevent sports injuries, studies regarding this issue offer conflicting conclusions (Andersen 2005; Ingraham 2003; McHugh and Cosgrave 2010). Authoritative, yet accessible, this guide provides the latest on science and technology from the world’s top cycling coaches and researchers. Comprehensive and cutting edge, coverage includes the rider–machine interface, environmental stressors, health issues, the planning of training programs, racing techniques, and more. Finally, the authoritative resource that serious cyclists have been waiting for has arrived. The perfect blend of science and application, Cycling Science takes you inside the sport, into the training room and research lab, and onto the course. In this book, editors and cycling scientists Stephen Cheung, PhD, and Mikel Zabala, PhD, have assembled the latest information for serious cyclists. "Cycling Science combines Stephen Cheung's immense knowledge about aerodynamics and training with the findings of the sport's top researchers and experts. If you want to know what it takes to ride faster, this is the book for you." "Cycling Science taps the leading minds in cycling training, fitness, and technology. A landmark work, it's beyond comprehensive and a must-have for anyone who wants to truly understand our amazing sport." "Stephen and Mikel are known throughout the world as experts in the world of physiology, and they have brought together the world's experts for this book. 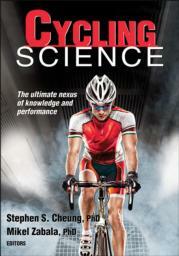 An incredible compilation of knowledge that is sure to improve your cycling!"